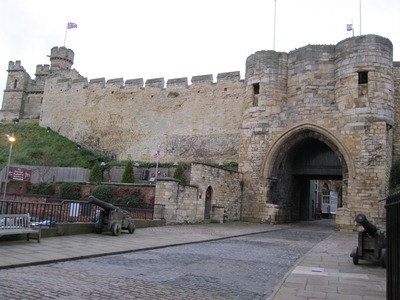 The Lincoln Castle was built by William the Conqueror, late in the 11 century. During the Norman Conquest he recognized the site as an important strategical point. Several important communication routs went past the site, and it was essential for fresh troops to reach other strategic locations. The castle was completed in 1068, two years after the defeat of Harold Godwinson. Since then, the castle has been sieged twice. The first time, in 1141, it was held. The second time, in 1217, it was conquered. Both attacks led to improvements being added to the castle. After the medival age the castle was used as a prison. The castle is very well preserved. Today it is used as a museum. One of the main attractions in the castle is one of the four exemplifications of Magna Carta. The Eye of London is the tallest Ferris Wheel in Europa, 135 metres tall. It is the most popular tourist attraction in London. More then 3,5 million people visit it every year. In clear weather you have a 40 kilometres view from the top. It has 32 capsules with room for 25 people each. Seating is provided for the the guests, but one is free to walk inside, getting full advantage of the 360 degree view. One revolution around the wheel take about 30 minutes. Madame Tussauds is a famous wax museum. The original museum was created by Marie Tussaud, a French wax sculptor who traveled Europa for a great part of her life. During her time, she made lots of wax statues of famous people, convicted criminals and even dead people that were victims of war. In 1835 she was settled in Baker Street, London, where she opened the museum. One of the main attractions was the Chamber of Horrors where many vax figures of dead people from the French Revolution were displayed. 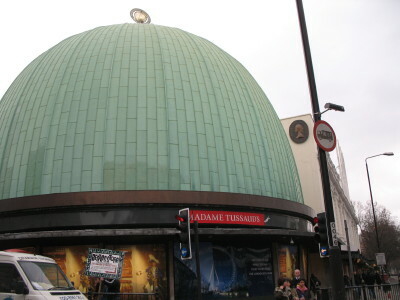 Today Madame Tussauds has branches all over the world, featuring wax figures of royals, film stars, sport stars and famous murderers, just like the original in London. 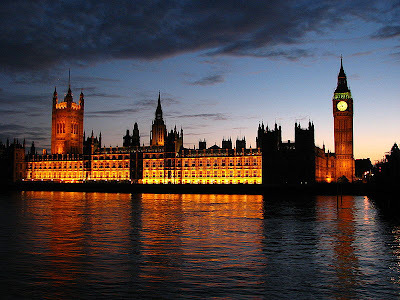 The Palace of Westminster lies on the north bank of th River Thames, central in London. Since it was first built in the 11th century, it has been almost completely destryed by fire twice. Once in 1512, and then again in 1834. It was originally built as a royal residence, but is has been the home of the parliament since the first fire. Now it serves as the venue where the House of Lords and the House of Commons meet, and a central point of United Kingdoms politics. One of the best known features of the palace is the Clock Tower, known as Big Ben. 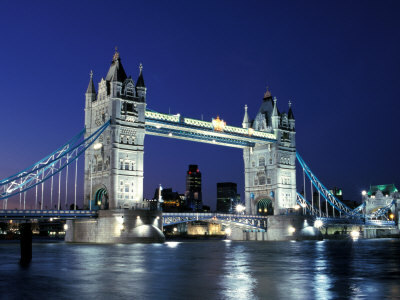 It is a well known icon of London and United Kingdoms, and is listed as a UNESCO World Heritage Site. Although the palace is closed for casual visits, one can que up for admission. There is no guarantee, though, because of limited capacity. The Stonehenge is a series of standing stones placed in a circle in Wiltshire, England. It is in the centre of a huge archeologic complex consisting of Neolithic and Bronze Age monuments. It is not clear exactly when the stones were erected, but it is common belief that it was some time between 3000 BC and 2000 BC. The site is a UNESCO World Heritage Site. It is unclear what the function of the monument was. It has no written documents from it's creators. However there are several more or less plausible theories, giving birth to more then one widespread legend. The Tower Bridge is a London icon. It's name is derived from the nearby Tower of London. It is 65 metres tall and the longest span is 61 metres over River Thames. The central span of the bridge, between the two towers, can open to let ships sail through. The side spans are constructed as suspension bridges. This combined bascule and suspension design was created by the architect Sir Horace Jones. In the old engine rooms of the south tower you can find a museum. Here you can see some of the original hydraulic machinery that was used to lift the bascules and other similar artifacts. Traffic on the river below is reduced compared to hpw it used to be. The bascules are lifted about one thousand times a year, often just to please tourists. Traffic on the bridge is still quite high. About 40.000 people cross the bridge every day. 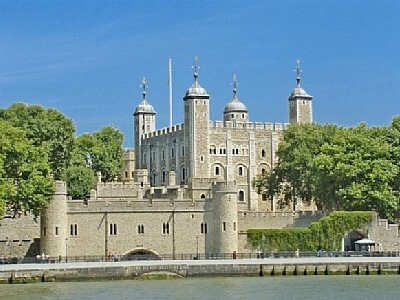 Her Majesty's Royal Palace and Fortress, commonly known as theTower of London lies at the bank of River Thames in central London. The big castle is a complex of several building, with the huge white tower being the one that gave the castle it's name. The foundation of the castle was laid in 1066 AD. After this it was expanded several times, until it got it's current shape in the 13th. century. Over the years it has been used for many porposes, including royal residence, prison and executions. It is an important piece of English history since control of the castle about equals control of the country. There are also other intriguing stories connected to the castle. It is no longer the royal residence, but it still houses the Crown Jewels as well as several ghosts, know to wander there. Today the castle is one of the main tourist attractions in England. The castle is open to the public and many areas have been restored to their original glory. Wembley Stadium is a multipurpose stadium. It was officially opened in 1923. In the year 2000 it was closed and demolished for a rebuild. Seven years later the new stadium was opened. It is the biggest stadium in Europe, with a capacity of 105 000 spectators. It is probably best known as a football stadium. 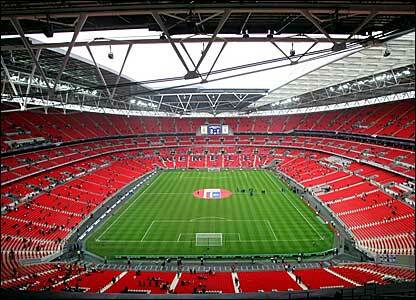 It is the national arena for the English football team, and is usually the venue where the FA Cup final is held. Aside from football it is been used for many other events. Many of the best known artists in the world have performed there. It was the main arena in the 1948 Summer Olympics. It is also used as a rugby stadium, and has even been used as a car racing arena. It has a partially retractable roof, and a 143 metres high arch is a well known signature feature. 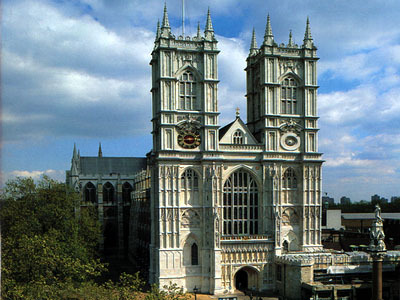 The Westminster Abbey is a huge gothic church, close to the Westminster Palace, in London. It is the church where the coroniation and burial of monarchs of the Commonwealth realms traditionally take place. The construction of the current church was started in 1245. It was largely completed by 1517. The site, however, is a much older, and it has a long history, stretching back to the 7th century. The church is now inscribed as a UNESCO World Heritage Site. One of the oldest parts of the church, dating back to the vaulted undercroft beneath a former monk's dormatory, is transformed into a museum. In the museum is a collection of royal and funeral effigies.